Love Village, we will have to play that sometime. Some really good 'The Works' games there as well, Havana is one of my favourites. Haven't played Sylla or Taj Mahal yet. Nice collection! But, more importantly, are those your bunnies? We have two rexes and one is almost the spitting image of the lighter coloured one! RikTheChief wrote: Love Village, we will have to play that sometime. Some really good 'The Works' games there as well, Havana is one of my favourites. Haven't played Sylla or Taj Mahal yet. Yeah, Village is great. Very happy to play that. Lots of Works specials, yep! Sylla is good and thematically works well but is a bit complicated at first. Played it a couple of times and had forgotten how to play between them but we all enjoyed the games once we'd worked it out. Taj Mahal is good too, and a fair bit simpler. Happy to bring and play either of those. 20th Century was from the Works too and I think it's really good, but was a bit too complex for the people I played it with so they won't play again, so I'd like to give that more plays. Happy to bring any of the games I have to play if anyone fancies any of them but I'm particularly keen to play Food Chain Magnate having got it recently so please shout if anyone wants to try that. I've only played it once, two player, but I reckon it has the potential to be a firm favourite. I know the rules but not the strategy so it would be ideal to play with new people now. I even made some card accordion things so that it doesn't use a ridiculous amount of table space. I like Concordia and Chicago Express lots too. paulyg wrote: Nice collection! But, more importantly, are those your bunnies? We have two rexes and one is almost the spitting image of the lighter coloured one! Yep! They're my buns. Mini rex girls, three years old. They're called Cinnamon and Pepper. Please post a pic of yours! Thank you! I will pass that on to them. I played Food Chain Magnate once. My brain melted and ran out of my ears. I'd like to play again. Happy to bring any of these to play if anyone fancies any of them but I'm particularly keen to play Food Chain Magnate having got it recently so please shout if anyone wants to try that. I've only played it once, two player, but I reckon it has the potential to be a firm favourite. I know the rules but not the strategy so it would be ideal to play with new people now. I even made some card accordion things so that it doesn't use a ridiculous amount of table space. I like Concordia and Chicago Express lots too. I'd like to play FCM! Could do this Tuesday? These are our mini rexes - Waffles and Dumblepaws - who are sister and brother. Meurig wrote: Are they Australian rabbits? Haha! Picture looks normal on my iPad but for some reason upside down when I check on my computer. How bizarre! I'll try to fix it later. On another note, My parents' dog is called Waffle! That would work for me. Would it suit you, Tom? I think three or four players would be good. 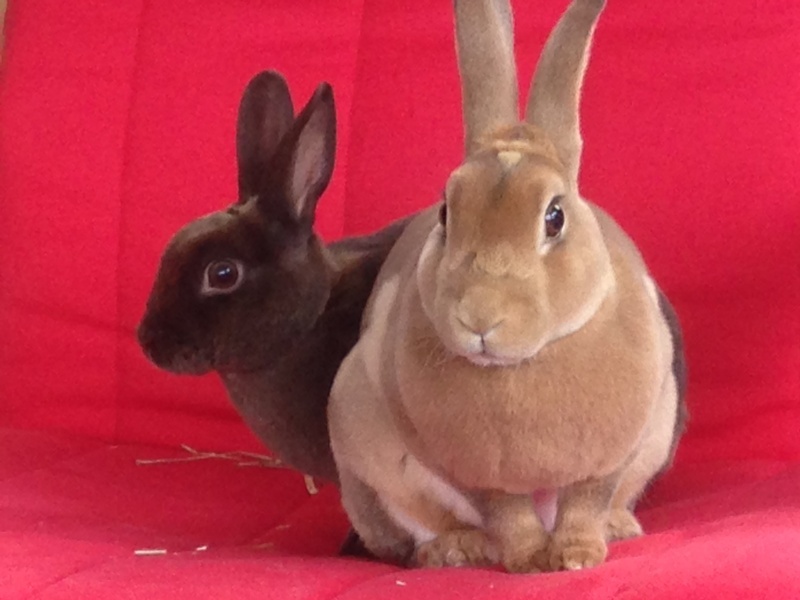 Aww, I can't remember what my bunnies' parents were called but mine are from two different litters. So it's pretty likely one of mine is related to yours! Updated to include a couple of dexterity games: a cheap Ikea Carrom board, which I forgot about; and Cube Quest, which arrived today and is awesome silly fun. Flick cubes at your opponents cubes and try to knock them off the playmat. Different cubes have special powers. Takes 10 minutes to play. Lovely stuff. Did anyone else buy these? Any good? Origin looks particularly nice. Madame Ching is pretty good! A few of us played it at the expo. I'd certainly play it again. Haven't played any of the others. I'd quite like to try Shafausa, I haven't got that one. I've played Artificium a couple of times and I enjoyed it, fairly quick and light. paulyg wrote: Madame Ching is pretty good! A few of us played it at the expo. I'd certainly play it again. Haven't played any of the others. Played this the other day, really enjoyed it. Probably best with two though, makes it a bit heavier I think as you each have two expeditions, so more to consider. Very pretty game, too. One of the better Works specials, I reckon. I also bought Origin after playing it at Beyond Monopoly in York. Not a bad little game. And the components! The components!